Approximately 2.9 million sq.m of new shopping centre space was delivered to the European market in H2 2016. This took the total volume of completions for 2016 to 4.5 million sq.m, 6% lower than in 2015. Western Europe recorded 15% growth in new shopping centre completions in 2016. France was again the most active country in this region in terms of development and strong activity is expected to continue in the future, with consumer confidence improving, demand for new retail destinations strengthening and the number of international brands entering the market steadily growing. Italy and Spain recorded a strong year-on-year increase in completions in 2016, while development activity in the Benelux region was robust, with key projects such as Docks Bruxsel being completed. Development activity in the UK declined 17% year-on-year in 2016, with no new openings being recorded in H1. 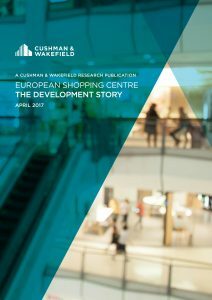 In Central and Eastern Europe (CEE), annual shopping centre completions declined by 17% in 2016, following an 11% drop in 2015. The ongoing geopolitical risks and rising shopping centre saturation levels in many large cities are the main reasons for this decline in activity across the region. Russia is still the largest shopping centre development market in CEE, despite annual completions falling to 1.2 million sq.m in 2016, which is the lowest level since 2005. Both regions are expected to see a further decline in shopping centre completions in 2017 – 18, with 6.8 million sq.m of space currently under construction and expected to be completed in this period. This represents a 26% drop when compared to the amount of space that was forecast to be completed during this period 12 months ago.